Queens went down 4-0 against Hibernian after goals from Brian Graham, a Chris Higgins own goal, David Gray and Martin Boyle saw the league leaders stroll to take all three points in a superb display. Caretaker manager Jim Thomson was forced into making two changes from last week`s Irn-Bru Cup Quarter-Final tie win over Alloa. Top goalscorer Stephen Dobbie and ex-Hearts man Jamie Hamill failed to shrug off their injury concerns. Captain Chris Higgins and young midfielder Jake Pickard were brought into the starting xi against the table toppers. Neil Lennon made two changes to his side that were held at home by Falkirk two weeks ago, with Ofir Marciano returning between the sticks and ex-Ross County forward Brian Graham replacing Grant Holt. Straight from kick-off the league leaders won the ball on the half-way line, exchanged some nice one-twos, the ball fell to ex-Inverness midfielder Andrew Shinnie, who tried his luck from 25-yards but his long range effort was comfortably collected by Queens goalkeeper Lee Robinson. The hosts had the majority of the early possession and their positive start was rewarded seven minutes in. Darren McGregor picked up the ball up on the edge of the penalty box and his low powerful drive was blocked just in front of goal by Grant Anderson. But Anderson couldn`t get the ball out of his feet and in nipped Hibs striker Brian Graham to convert the ball in from close range. Queens had their first attempt at goal on 15 minutes. 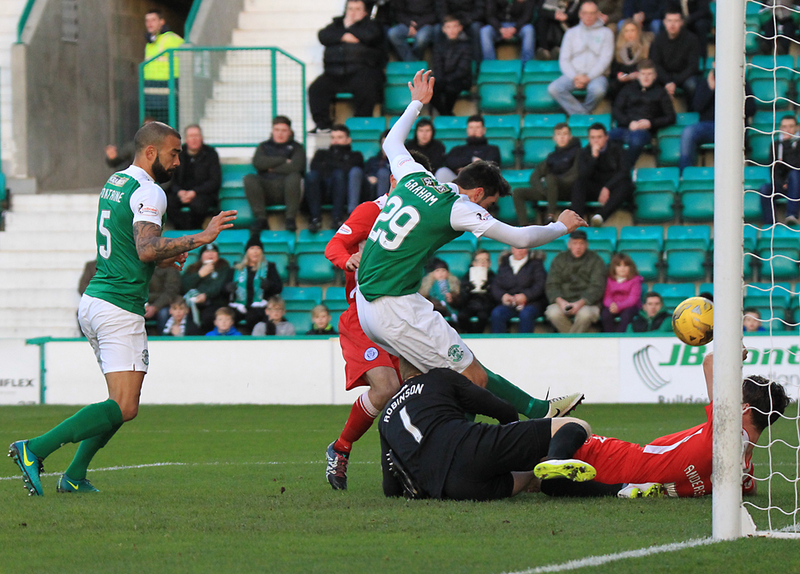 Jordan Marshall was fouled by Hibs captain David Gray, 25-yards out from goal. Derek Lyle took the free-kick but his effort never looked likely to trouble the `keeper and ended up in the stand. Jim Thomson`s side would have to thank `keeper Lee Robinson for not going two behind on 18 minutes. A mix-up on the half-way line between Andy Dowie and Darren Brownlie, allowed Martin Boyle through on goal but Boyle was denied by a superb save from Robinson. The Doonhamers didn`t look at the races and could only muster up long-range shot, this time Jake Pickard turned 22-yards out and ballooned an effort over Maricano`s bar. Hibernian hitman Martin Boyle had another opportunity on 26 minutes when a ball over the top caught the Queens defence out and released Boyle, who saw Robinson rush of his line and dinked the ball high over him but only to see his effort hit the wrong side of the net. On 29 minutes Jake Pickard was brought down by Paul Hanlon, just outside the penalty area. This time, Mark Millar stepped up and saw his free-kick beat the rooted Marciano but crack off the left-hand post. Five minutes later, Boyle had another chance to get his name on the scoresheet when he gathered the ball inside the box but was denied again by Lee Robinson from eight yards. But Neil Lennon`s side finally doubled their advantage three minutes before the interval when John McGinn outmuscled Lyndon Dykes on the edge of the box and fired a low shot, which took a deflection off of Chris Higgins inside the six yard box. In the final moments of the half, the majority of the 13861 inside Easter Road couldn`t believe their side weren`t three ahead when Boyle fired wide from close range. Referee Craig Charleston blew for half-time, with Queens being second-best from the first whistle, it was already proving to be a long afternoon for the Doonhamers. Like the first half, the hosts started the strongest and could have put the game to bed but again Lee Robinson was on hand to deny a Lewis Stevenson strike from the left hand side. 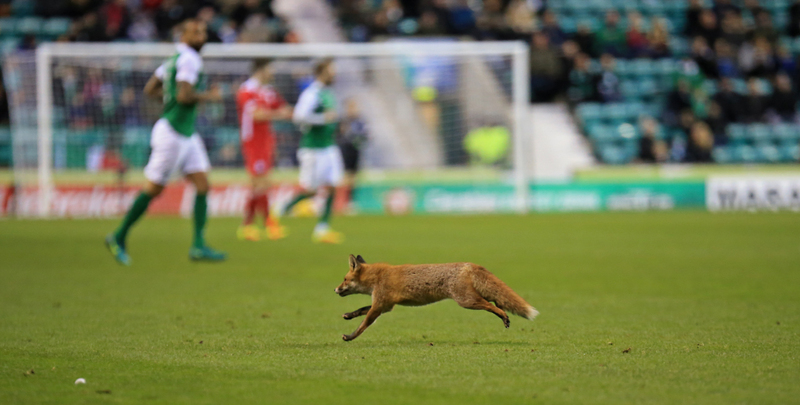 Queens supporters didn`t have much to chuckle about all afternoon but were smirking when a fox briefly stopped play and scurried across the Easter Road pitch. The smirks turned into frowns moments later as Queens` day at the capital went from bad to worse as goal number three arrived for the hosts. McGinn`s near post corner was flicked into the net by skipper Gray, who was closely marked by substitute Dean Brotherston and took a nick off him too. Queens had a glorious opportunity to score on 58 minutes when a Paul Hanlon slip, opened the door for Dykes and raced through on goal, but he took a heavy touch whilst rounding the `keeper and knocked the ball out of play for a goal-kick. The Doonhamers looked down and out, and were lucky they weren`t four behind when Boyle`s effort was palmed away by Robinson. 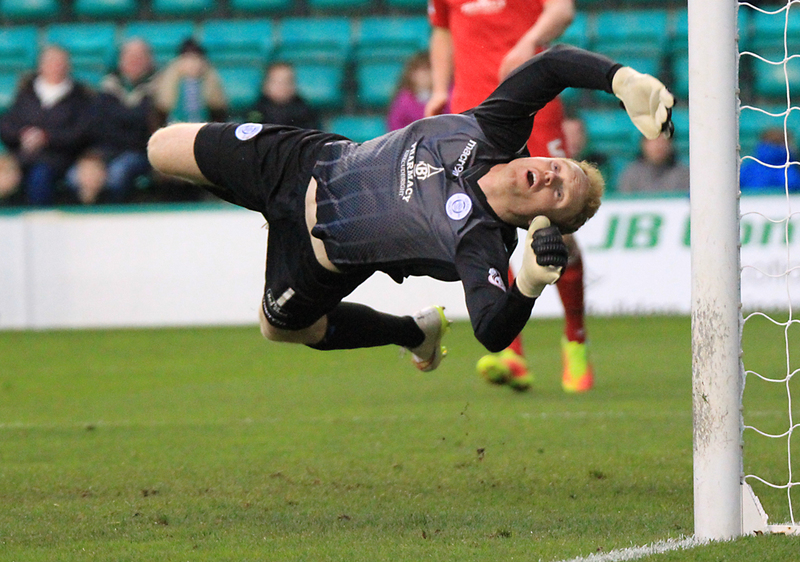 Robinson was at it again when he pulled off a terrific save from Brian Graham`s shot. 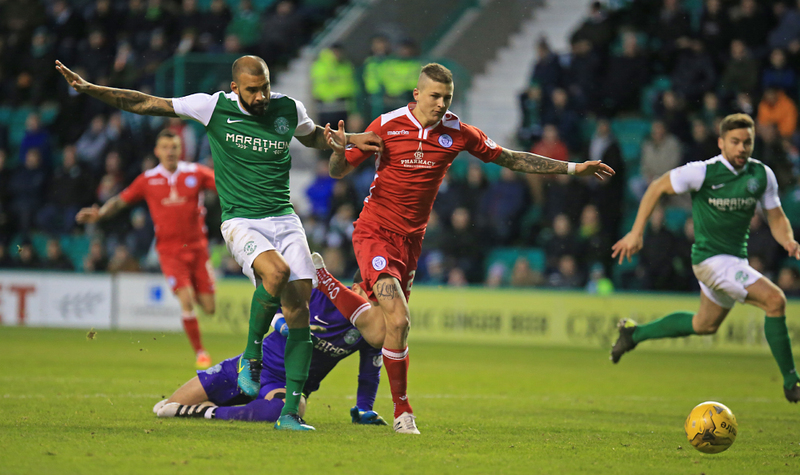 The fourth goal finally came for the Hibees when Martin Boyle finally got the better of Robinson weaved his way through the Queens defence and blasted a fine strike past Robinson. The visitors did have a late attempt to get on the scoresheet after some brilliant build-up play ended with Jordan Marshall having a shot from 20-yards but went inches over the `keeper`s bar. It wasn`t a great afternoon for the Palmerston outfit but next week Queens turn their attention to the Third Round of the Scottish Cup when they face League One side Albion Rovers at Cliftonhill. 14:39 Hibs subs; Laidlaw (gk), Bartley, Holt, McGeouch, Forster, Cummings, Crane. 14:40 Today`s referee is Craig Charleston. His assistants are Mark McLean and David Ingram. 14:59 The teams are out and we are only moments from kick-off. 0 min Derek Lyle and Kyle Jacobs to get us underway. 1 min Shinnie`s long -range effort is comfortably saved by Robinson. 4 min Gray`s cross is blocked by Brownlie. 8 min McGregor`s shot is blocked on the line from Anderson, but he can`t get it out of his feet and Graham taps in from close-range. 16 min Gray fouls Marshall 30-yards out. 17 min Lyle takes the free-kick and blasts it over the bar. 20 min Boyle is through on goal and his effort is superbly saved by Robinson. 30 min Millar`s free-kick smashes the post. 35 min Robinson denies Boyle again, this time from eight yards out. 43 min McGinn`s deflected shot gives the hosts a two goal advantage just before half-time. 46 min Stevenson shot from eight yards is palmed away by Robinson. 54 min Gray drives inside the box and his effort is put into the net by Brotherston. 58 min Dykes nicks the ball, is clear through on goal , tries to round the keeper but his touch is too heavy and goes out for a goal-kick. 61 min Robinson denies Graham from close range. 64 min Boyle smashes the ball past Robinson to make it 4-0 to the league leaders. 67 min Shinnie`s effort from 20-yards is palmed away by Robinson. 68 min Cummings is on for McGinn. 82 min Jacobs effort is caught by Marciano. 88 min Cummings effort deflected out for a corner.